We have come from Brandy’s Piano Bar in the Upper East Side and life is incredible. There are certain times you have a meal and the first thing you think about as you go to bed is how you could ever do justice to describing it to your friends and family. Well tonight I’ll try before bed. As I drink a sour beer from the craft beer shop down the road I am thinking of how to put the experience at Daniel into words. Firstly, it was not perfect, thank goodness. If there was not one small error made I would have nothing to strive for in dining terms. The imperfections were incidental and minor, so this is an absolutely huge night out. I’m thinking about the carrot veloute with Peekytoe crab. 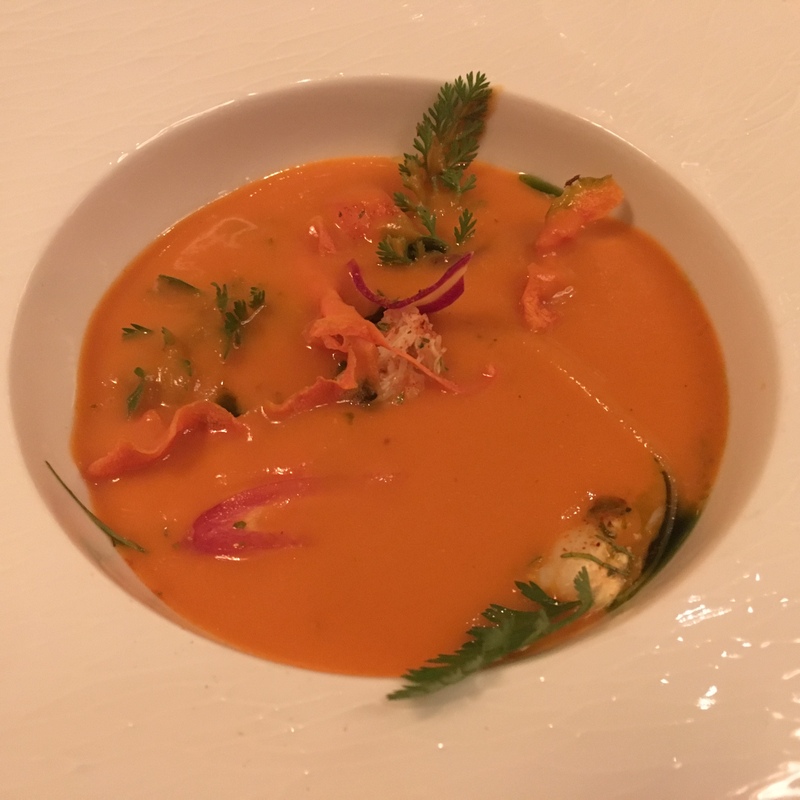 A cold carrot soup that is indescribably deep in flavour, showing off reasonably generous portions of crab, and slithers of carrot that are heavenly. Combining with the Premier Cru Beaune chardonnay (we got a half bottle), I am in my own little heaven. 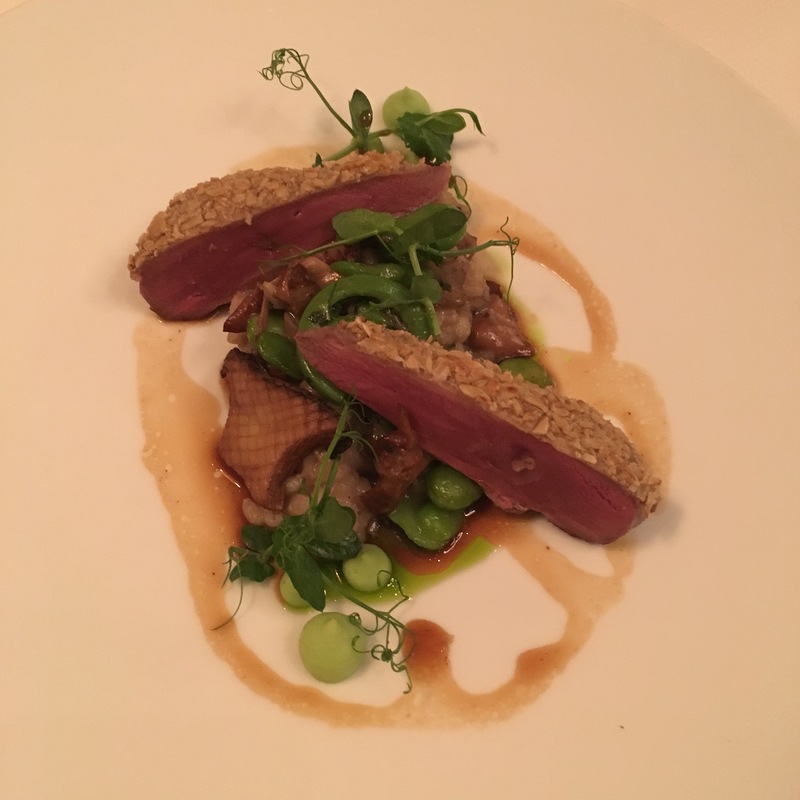 There is the second ten out of ten course in a row for me with the squab (pigeon) cooked medium rare, crusted in oats, with the most astonishing barley risotto I have ever tasted. The first thing I tasted was that barley, and then the mushrooms, layer on layer of perfectly seasoned flavour making me metaphorically blush for my own attempts at risotto. 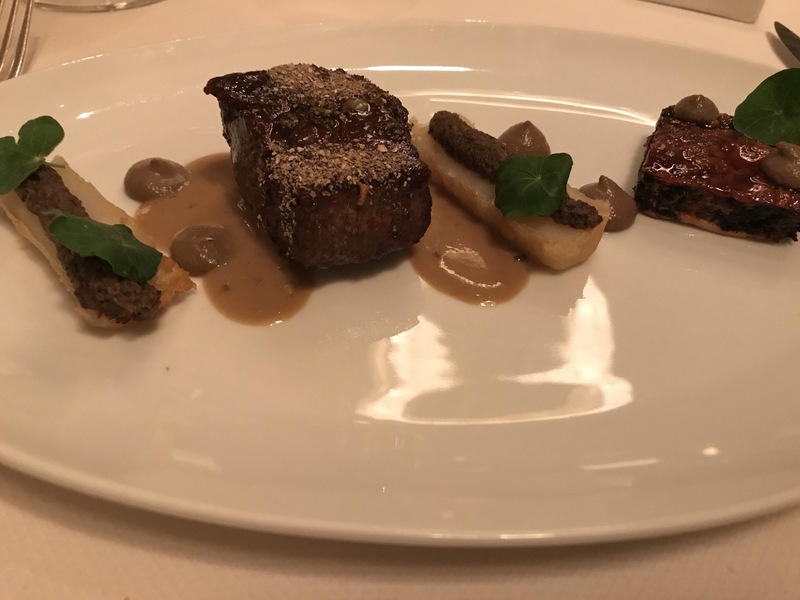 Then there are the several types of mushrooms accompanying the pigeon, and the chicken jus that is drizzled by the waitperson in a seemingly frivolous manner, but is as important as any other element. The burgundy chosen by the charismatic sommelier tops off the combination but in reality the wine is a bonus. At this stage Catherine is pretty much twenty out of twenty too. Her scallop ceviche melts in her mouth. This is not ordinary seafood. 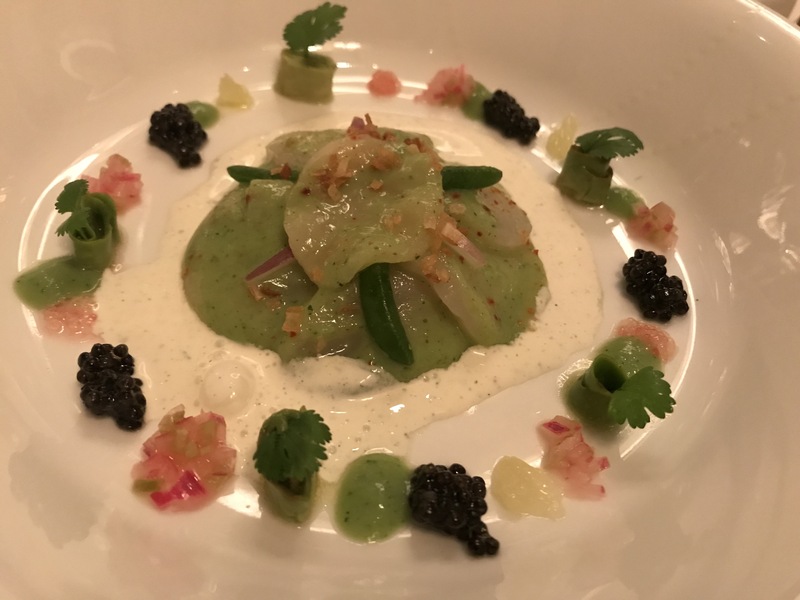 Again the seas have swept something special up, and Daniel Bould has elevated it with avocado, finger lime and white sturgeon caviar. 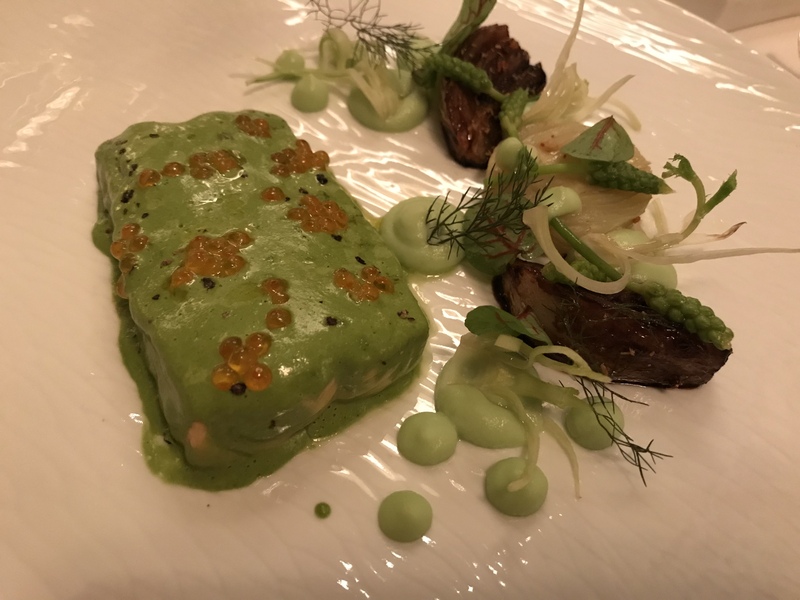 The follow up is a fish that is new to us, Arctic Char, that is covered in avocado, and married with asparagus, fennel and sorrel cream to provide another intriguingly familiar but different experience. 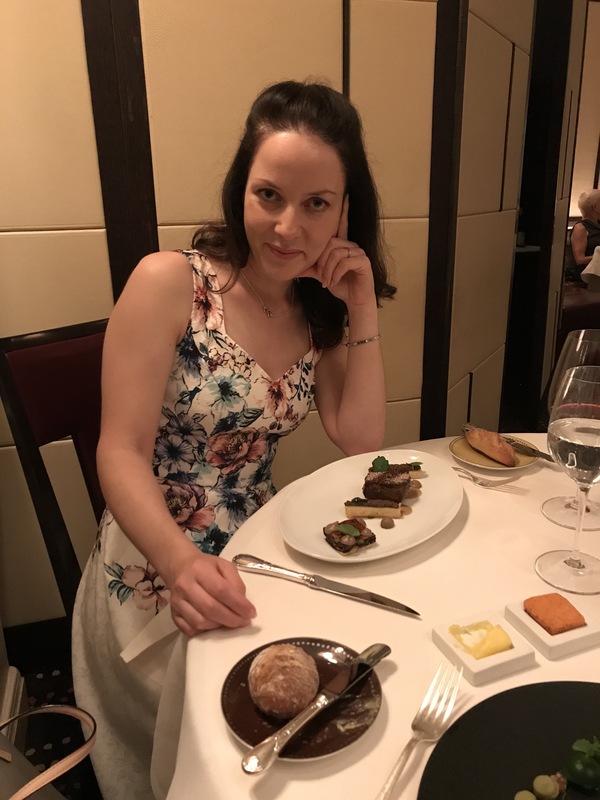 As we enjoy our third course, it is childish for me to say that I had a slight envy for Catherine’s wagyu even though I was enjoying the most beautiful medium rare veal tenderloin enveloped in gorgonzola that I’ve ever had. 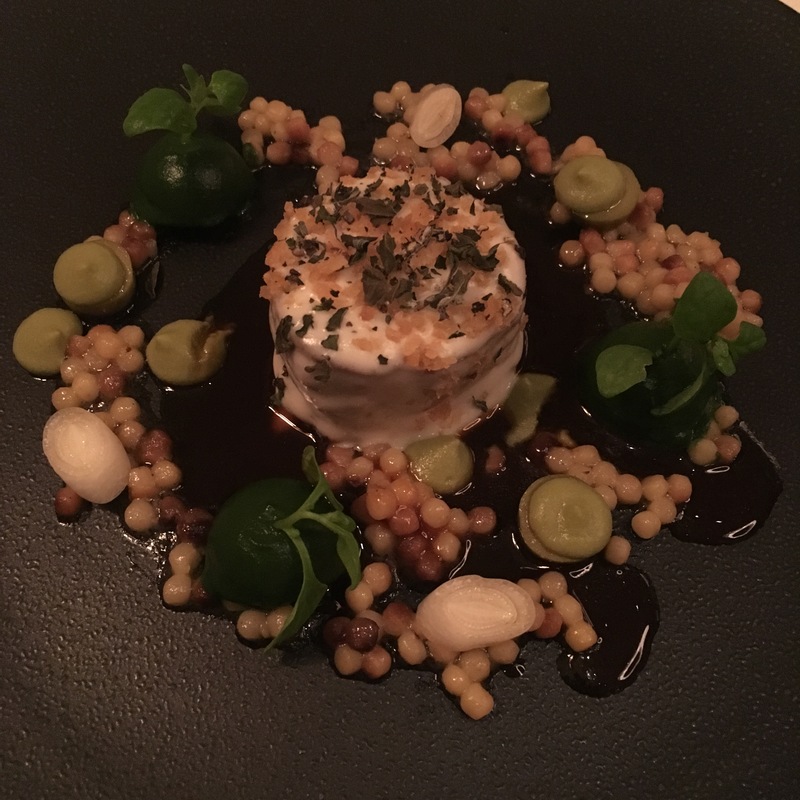 Along with the fregola and veal jus amongst other elements I was not in a position to be jealous. The Nebbiolo dominant wine from Northern Italy was a perfect match too. 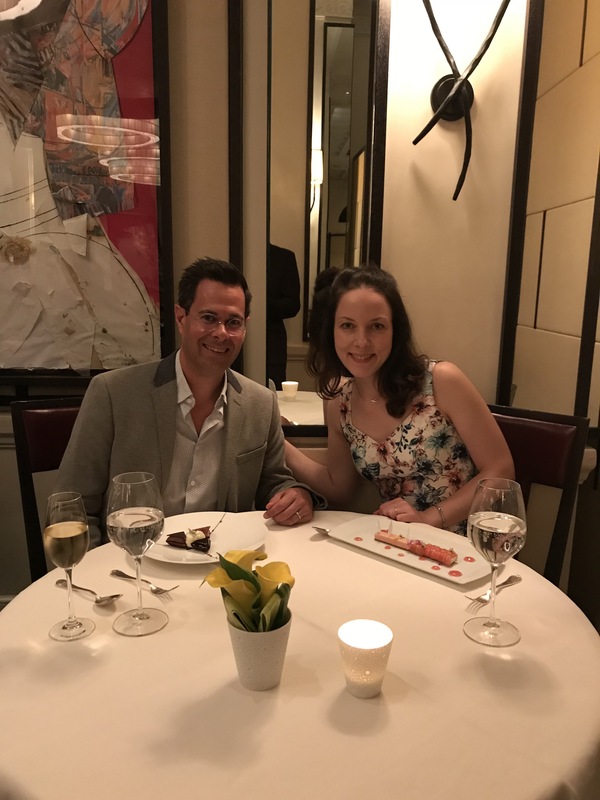 Catherine’s wagyu was simply outstanding. Looking at the menu it sounds like beef, potatoes and mushrooms. It is and it isn’t. The mushrooms are provided on thin strips of beautifully crisp potatoes and in the form of a “mushroom quiche” that looks more like a mushroom mille-feuille. They are all quite extraordinary. And she got the Graves’ Bordeaux that is Merlot dominant too. A serious winning combination that could rival the pinot-duck and fish-chardonnay match if it was more prevalent. Like interval at a performance, we were talking about where this particular meal stacked up. It is always difficult to determine at the time. All we can say is that dessert met (or was close) to its savoury counterparts. 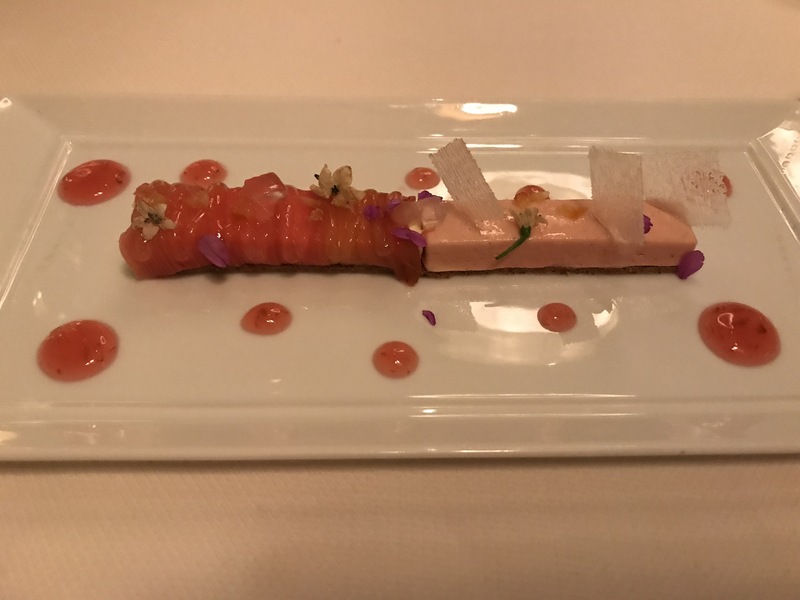 Catherine’s rhubarb dessert was superb from my one taste. 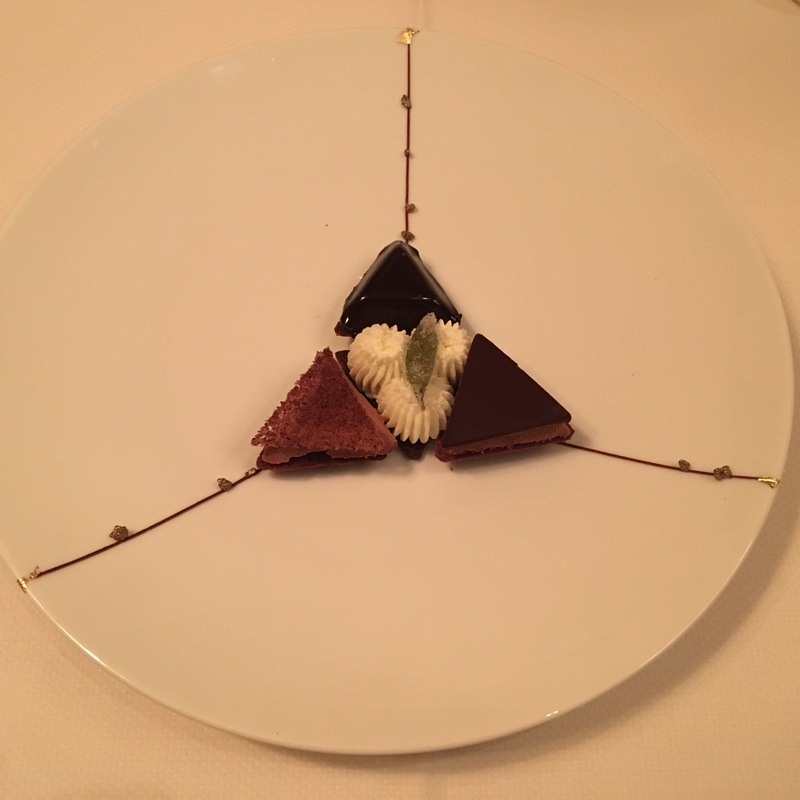 My dessert was more like a work of chocolate art. The first one I finished, but the last that I tasted, was the peppery chocolate ice cream such was its addictiveness. In between the mousse was gorgeous, and the Equadorian grand cru fondant was my start and end with the cream in the middle, and gold leaf, providing the extra edge. A Hungary tokjii was also beautiful to combine, in my humble opinion. 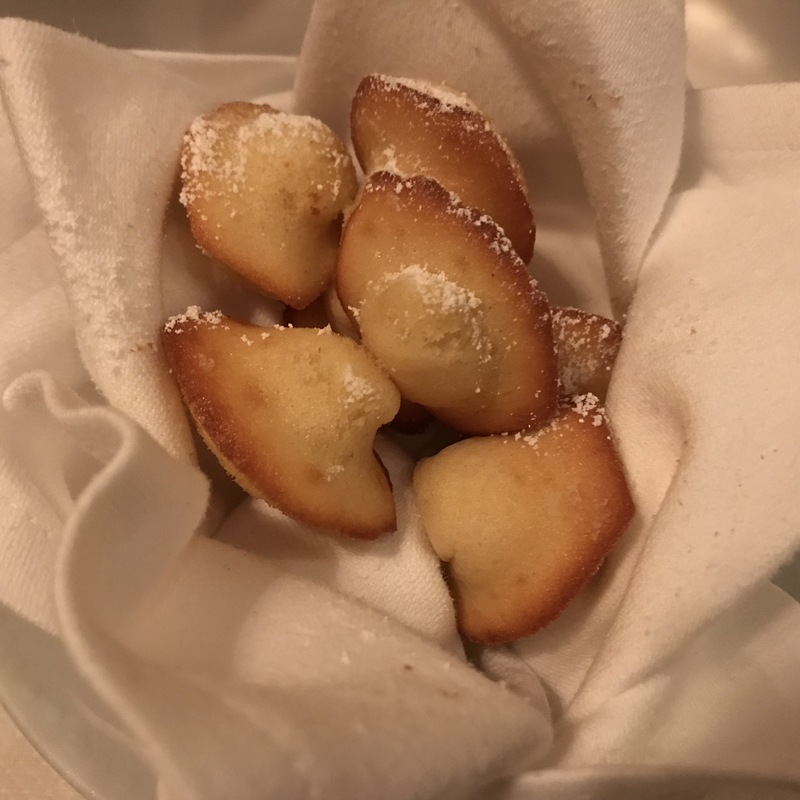 As the petit fours of chocolates (pineapple, bergamot, blueberry and raspberry), and house signature Madeleines came out, we were not daunted. We had gone toe to toe with the bread basket too – the baguette, brioche, three grain, and parmesan, all doing their bid for supremacy and the salted butter showing off the beauty of simplicity. Our waitstaff were superb. To fault them would be nitpicking. There was care and attention; professionalism and attention; delicacy and humour. We simply had a wonderful time. It is crazy to imagine there are people out there who get to enjoy this on regular occasions. Unlike that wagyu dish that I want more of, there is no jealousy. 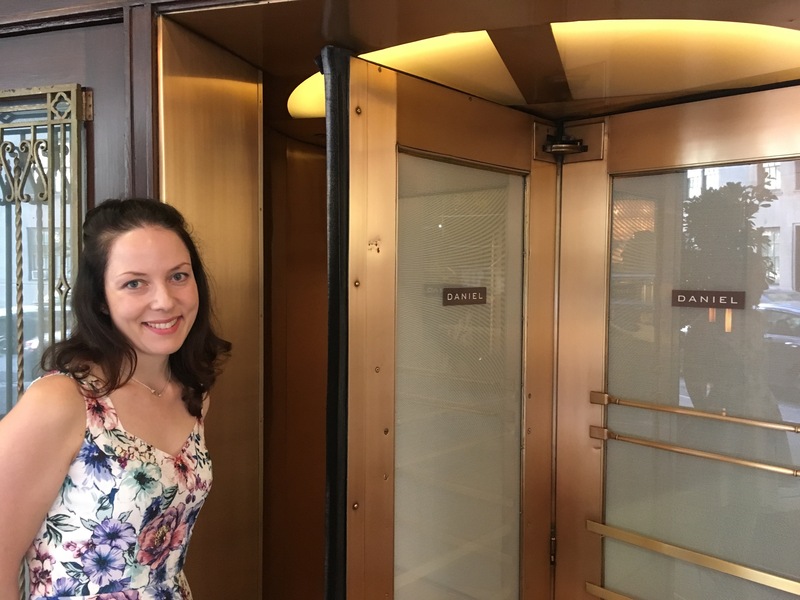 We’ve just had an experience that feels like it is once in a lifetime. This entry was tagged Arctic Char, Carrot Veloute, Daniel, Daniel Bould, Expensive, Fine Dining, Gastrotemple, Good Service, Good Wine, Madeleines, Maine sea scallops, New York City, Peekytoe Crab, Pigeon, Prix Fixe, Restaurant Daniel, Two Michelin Stars, Upper East Side, Veal tenderloin, Wagyu. Bookmark the permalink. Some random Easter shots. A few nice catch ups, lots of hot cross buns and chocolate, running every day, and a few beers and negronis. Definitely one of my favourite weekends of the year.